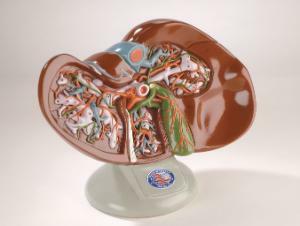 Color-coding clarifies the complex vascular network of the liver and gallbladder in this illustrative model. Contrasting colors differentiate the portal vein and its branches, the gallbladder and bile ducts, the hepatic artery, and the hepatic veins. The ventral surface of this replica is also dissected to expose major blood vessels and bile ducts in deep relief. The accompanying key identifies 28 hand-numbered structures. This 1⅟₂ times life-size model is mounted on a base.